Product prices and availability are accurate as of 2019-04-18 16:00:11 UTC and are subject to change. Any price and availability information displayed on http://www.amazon.com/ at the time of purchase will apply to the purchase of this product. 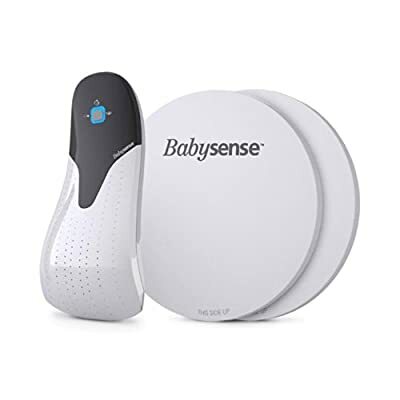 The BabySense V Infant Movement Monitor utilizes highly sensitive motion detector technology within sensor pads that can detect a baby's smallest movements. The system's green light flashes with every movement your child makes. If there is no movement for 20 seconds or the system detects less than 10 micro movements per minute, an alarm sounds and the red light flashes. Parents will know immediately when their child needs attention. The monitor features a convenient low-battery indicator light and can hang right off the bottom of the crib, thereby, eliminating the danger of infant cord entanglement. It is lightweight and portable with a single button for easy operation, and the monitor will not be affected by wireless interference from other electronics. This set includes 2 sensor pads to cover the entire crib or for separate use in an infant's crib and bassinet. The pads are placed beneath a mattress and will not interrupt your child's sleep. You can rest easy knowing that your child is safe.